Order Biona Coconut Palm Sugar - Organic from the Online Health Food Store UK. Buy Biona organic coconut palm sugar 250g and other quality Sugar & Sweeteners safely online in the UK. Organic Coconut Palm Sugar is the perfect alternative sweetener for drinks, desserts and baked goods. Enjoy the rich butterscotch flavour of our Biona Coconut Sugar - the perfect alternative sweetener for drinks, desserts and baked goods. With a low melt temperature and high burn temperature, coconut sugar is especially suited to everyday cooking needs. Made from the liquid nectar of the coconut blossom, coconut palm sugar is a low GI sweetener with a glycemic value of 35, compared to regular cane sugar which is typically GI 68. 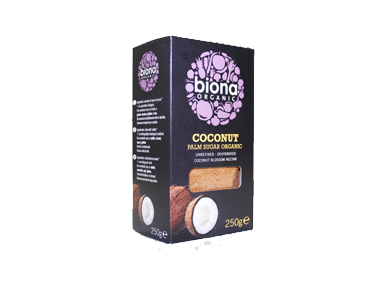 Biona Coconut palm sugar has not been filtered, processed or bleached. As official Biona stockist in the UK, we sell quality Sugar & Sweeteners to customers throughout the UK in England, Wales, Scotland and Northern-Ireland. Where to buy Biona Coconut Palm Sugar - Organic safely online? Shop at the Online Health Food Store if you are wondering where you can buy Biona organic coconut palm sugar 250g safely online in the United Kingdom. Our Health Shop is located in the UK and our award-winning independent has been serving customers in England, Wales, Scotland and Northern-Ireland since 1976. You can buy our Organic foods suitable for vegetarians and other quality Sugar & Sweeteners online and we post out orders to any UK address. Coconut Palm Sugar - Organic - Biona organic coconut palm sugar 250g in Sugar & Sweeteners and Foods.